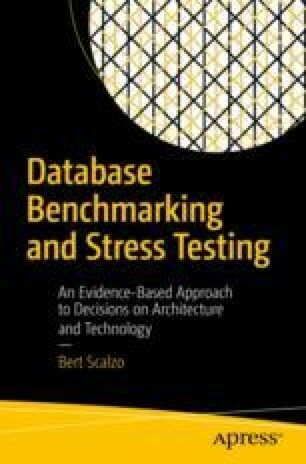 The last chapter covered some hardware options important to review and consider changing when performing database benchmarking projects. While hardware advances the past decade have been nothing short of amazing (e.g., I just built a new desktop PC where the CPU offers 16 logical cores or threads), we cannot and should not always automatically look to hardware for solutions to performance issues. In reality, most benchmarking efforts can see the largest improvements to performance scores by leveraging appropriate new database features. The database vendors have likewise made significant improvements, often in response to leverage many new hardware technologies. This chapter will focus on both normal database features to consider as well as the newer ones that leverage these new hardware technologies.